UnglueYou uses a visual approach to facilitate lunch and learn seminars for organisations. Through the use of individual image cards we introduce an engaging and creative way of exploring, sharing and communicating ideas. The value to your organisation of working with UnglueYou is our visual tools and creative approach quickly and effectively tap thoughts and ideas that may be hard to articulate or lie below the level of consciousness. Allowing new perspectives and deeper insight on your chosen theme to emerge. Further exploration through discussion of the images enables meaningful outcomes in a short time frame. 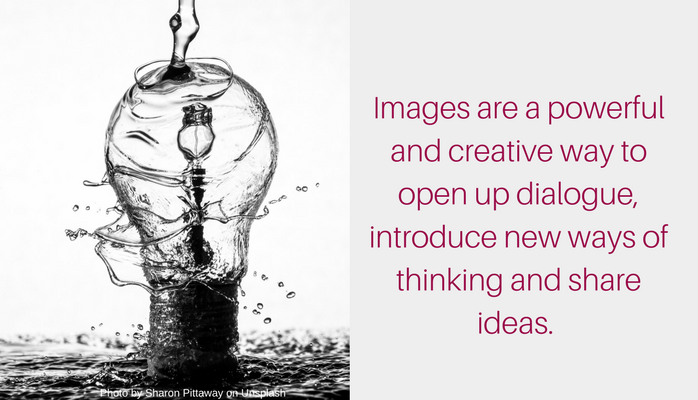 Using individual images means the topic can be tailored to meet the current needs of your organisation. Alternatively, you can choose from an existing topic. Our lunch and learn seminars are a cost effective way to support work based learning. They facilitate dialogue, discussion and problem solving. As well as providing a forum for employees to interact in an engaging, informal and creative way. Which in turn fosters a genuine environment of communication and collaboration. If you work in Human Resources or learning and development and would like to know more please get in touch. The language of the mind is predominantly non-verbal, metaphorical and teeming with images.